During the Intel Xeon Scalable release (Skylake-SP) in 2017, we covered the new naming conventions. Out were the Xeon E5 and Xeon E7 designations and in rushed the precious metals of Bronze, Silver, Gold, and Platinum. You can read more about the different names here Intel Xeon Scalable Processor Family: Platinum Gold Silver Bronze Naming Conventions. During the process, the high-end “E7” line was essentially merged into the same line as the company’s mainstream processors. At a platform level, it is great for users as it means one can use the same socket to scale from one to eight processors. From a marketing standpoint, the Intel Xeon Platinum CPUs are the number one item competitors focus on. We want our readers to be well informed about what they read and share why we have been taking a stance against using Intel Xeon Platinum 8100 series CPUs in many of our comparisons. The problem is that the Intel Xeon Platinum series is priced for 4 socket and 8 socket configurations where the systems are much more costly, but also designed to be discounted more heavily. 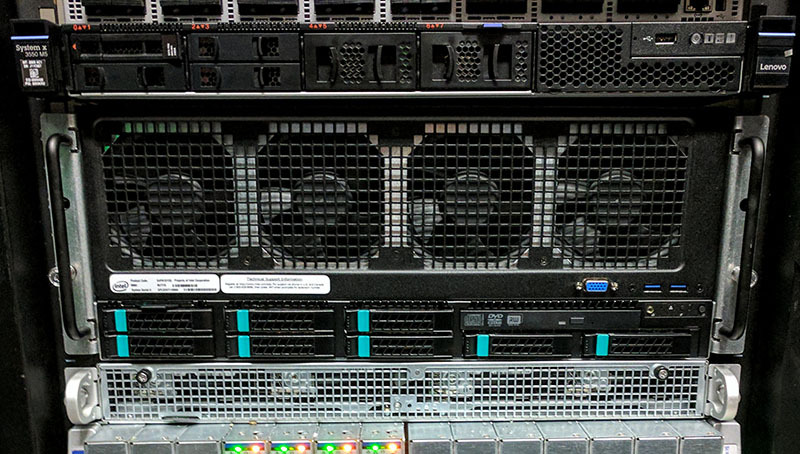 The CPUs still function in dual socket servers so we have review systems such as our Dell EMC PowerEdge R640 Review and Dell EMC PowerEdge R740xd Review where Dell EMC sends us dual-socket servers with two Platinum 8180’s. This is because the company wants to ensure its systems perform well. We understand this posture but it has become a marketing headache for Intel. Now that there are alternative CPUs in the market such as the AMD EPYC 7001 and Cavium ThunderX2, that offer 32 cores per socket, more than the Platinum 8180’s 28, the comparison is natural as Intel’s top offering in the dual socket segment. Sure, the 8180’s are intended for different markets, but that does not stop the comparisons from rolling in. We covered this in our piece Intel Xeon Platinum 8158 v Intel Xeon Gold 6136 Differences. What you can see above is the impact of a “Platinum” SKU with a list price of $7007 and a Gold 6136 with a list price of $2460. The CPUs have essentially the same clock speeds, cores, and cache which drives the similar performance levels. 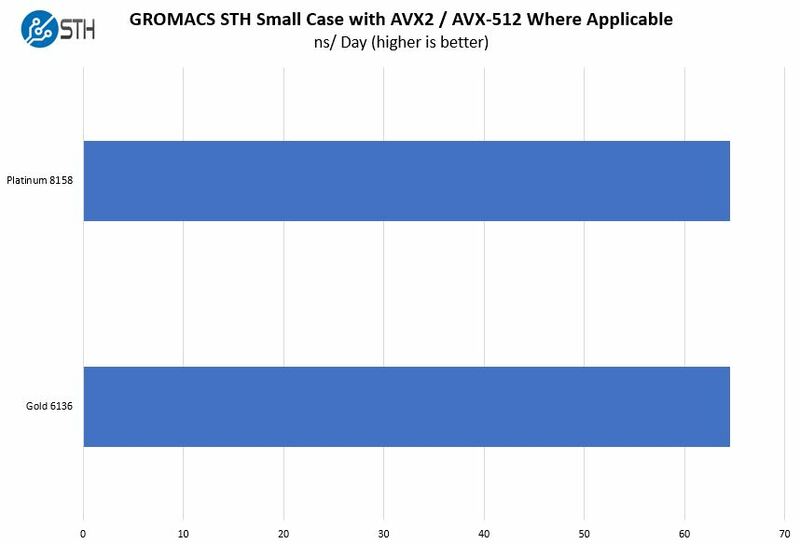 This is true across different workloads including AVX-512. Commercially, one of the only reasons to pick the Platinum 8158 over the Gold 6136 is if you want to scale to 8 sockets. Otherwise, you get over 2.8x the performance per dollar with the Gold SKU over the Platinum SKU. 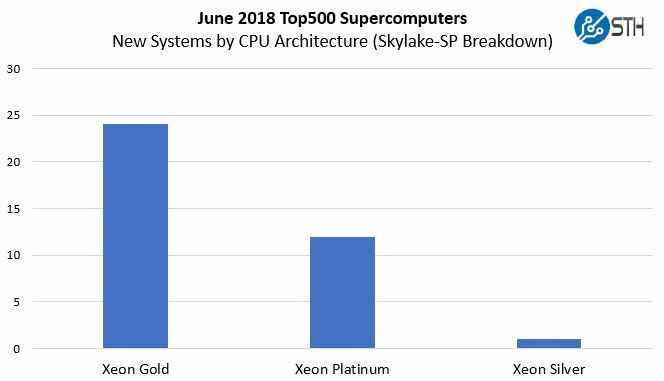 Even the HPC segment, primarily two CPUs per node, overwhelmingly pick the more cost-effective Xeon Gold over Xeon Platinum as we showed in our recent Top500 June 2018 Edition New Systems Analysis. 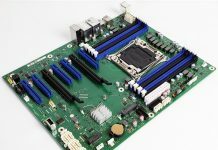 That means for any Intel competitor, you can use a $7007 SKU, designed for per-core licensing in 8-socket servers, put it in a dual socket server and show a great performance per dollar benefit. AMD has been having an absolute field day with the lack of segmentation as its pricing is geared towards dual socket only which compares well against the quad and octo socket capable Intel Xeon parts. 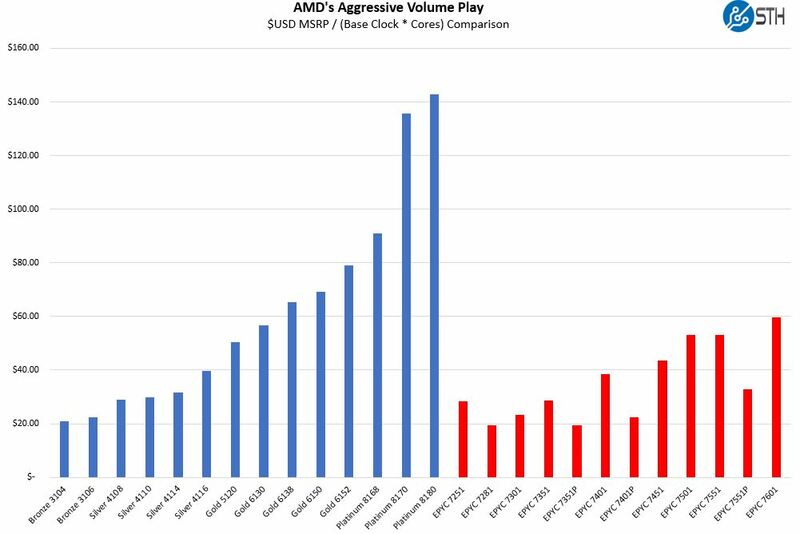 AMD uses its core, memory, and I/O advantages to push Intel further by suggesting a single socket AMD EPYC can match favorably with dual Intel Xeon Scalable CPUs (it can.) We discussed the Platinum premium in the context of how Intel Xeon Scalable pricing compares to AMD EPYC 7000 series pricing. You can see there is a large divergence here. Intel Xeon Platinum has another issue. The “M” series designation. Instead of having a clean model delineation like with the Intel Xeon E7 series, where one could move up the range to get more memory per socket. Now, there are SKUs with “M” designations. These are derivative parts that essentially cost $3000 more than their non-M siblings. Sure, using 128GB DIMMs means that the CPU prices are dwarfed by memory cost, but it is not a clean break. Instead of using Platinum as the designation for the higher memory capacity parts, there are Xeon Gold SKUs that support 1.5TB of RAM. That brings us to the next point, aside from 8 socket operation and holding the top performance parts, the Intel Xeon Gold line does not help the matter. During the press briefing before the formal launch, I suggested that the Gold 5100 series should be called “Jade” or something else. The Intel Xeon Gold 5100 line is frankly inferior to the Gold 6100 line on so many levels that perhaps it should be called Xeon Pyrite. Pyrite is what one may buy at a gift shop for a five-year-old child and tell them it is gold. Sure, it has some of the same colors and shines when polished, but it is not gold in the same way that there are massive differences between Gold 5100 and Gold 6100 processors. As you can see, in terms of the key differentiators, the Xeon Gold 5100 series does not have features to push it well beyond the Xeon Silver series. For the Gold 5100 series CPUs, the 2 UPI links essentially relegate it to dual socket configurations since in quad socket configurations you would want 3x UPI links. At the same time, adding to the confusion is that the Intel Xeon Gold and Platinum features here are very similar. Intel claims better RAS features for Platinum and scalability to 8 socket systems. At the same time, Intel is catering to a very specific set of use cases with Intel Xeon Platinum. These are use cases that competitors like AMD EPYC and Cavium ThunderX2 are not catering to at this point. This is a simplified model that excludes RAS features, for example, but it is what a lot of customers see. The fact that the Intel Xeon Gold brand is used for chips that are essentially Xeon Silver, save for a crippled 4-socket implementation (Gold 5100 series) and the fact that the main features of Gold 6100 are similar to the Xeon Platinum features that most buyers see, means that the Platinum has a tough time standing out. The Intel Xeon Platinum 8180 is actually a great chip. It has 28 x86 cores on a single die with six memory channels per die. It is designed to scale to 4-way and 8-way servers. While AMD EPYC 7000 and Cavium ThunderX2 have higher core counts and more memory channels, they are not directly competitive with the Intel Xeon Platinum 8180 and Platinum 8176 parts. As a result, at STH we are going to refrain from utilizing these higher-end chips in our direct comparisons unless it is specifically to show the pinnacle of a chip technology. You will notice in our Cavium ThunderX2 review we used the Intel Xeon Gold 6100 series to stay true to this stance. What the company missed was delivering Intel Optane Persistent Memory support to the Intel Xeon Platinum line which would have been a clear differentiator in the Skylake-SP generation. Along with Apache Pass Intel would have needed to increase the Xeon Platinum memory limits. That feature alone, albeit an arbitrary delineation, would have put an even bigger gap between the Xeon Gold and Xeon Platinum along with Xeon Platinum to other competitors in the market. 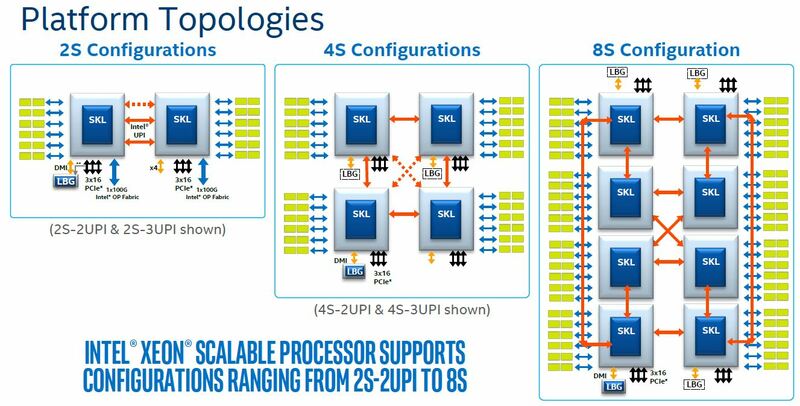 With that feature miss due to the Optane timeline (remember SAP Sapphire last year Intel Xeon Scalable Processor Family shown off with 3D XPoint) the first generation of Intel Xeon Platinum ran into its marketing issue. When it came time for launch, albeit an impressive engineering feat, the divergence of Xeon segmentation from the E5 and E7 lines has been a marketing headache. 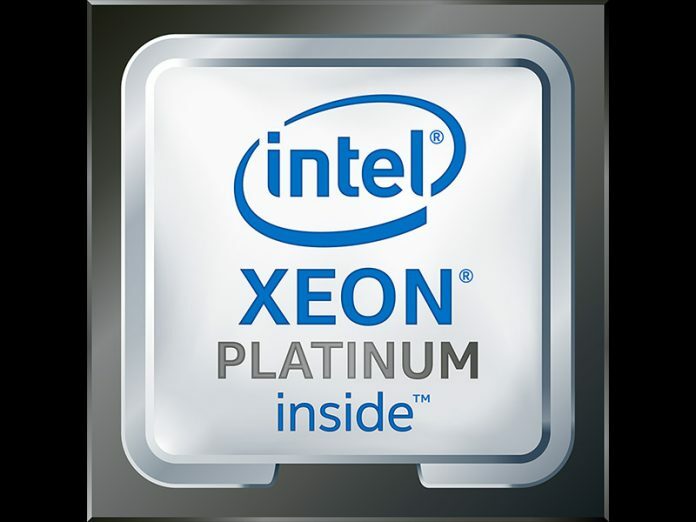 The Intel Xeon Platinum launched with a high price tag and insufficient differentiation for customers to understand the price premium associated with it. Next headache for intel is on it’s way, AMD Zen2 7nm in labs now, launch in 2019. I think one of the major problems is that now, if you want a CPU using the largest XCC die, you’re paying for socket support you may never use. Intel offered E5-2600 series CPUs with plenty of cores for much less than equivalent E5-4600 CPUs, socket support aside of course. Xeon Platinums don’t make sense for dual-socket servers because you’re forced to buy six more sockets worth of UPI. The Gold 5100 series is fine in dual-socket but only offers two cores over the Xeon Silvers. The Gold 6100 series meanwhile actually offers high core counts… and forces you to buy sockets you won’t be populating. Silver and Bronze are pretty barebones. Neither have high core count parts, and Bronze ditches Hyperthreading altogether. I’d hope that Intel brings back more affordable high-performance CPUs intended for dual-socket systems with Cascade Lake but I’m not holding my breath. You’re right that there’s virtually no Silver 4100 to Gold 5100 and Gold 6100 to Platinum 8100 differentiation. There’s a reason Intel’s got ultra slow adoption of the new Xeon’s. It’d be ok if it’s just saying we’ve got these different levels but pricing is similar to the E5V4. With the new names, dropping E7 and raising prices you’re not getting more for the same money. You’re getting at best equal to the E5V4 for the same money. Intel has to fix this or there’s a 10-20% market share loss coming soon. We’re using 2S systems with 8168s for applications where we need a large single box as the application doesn’t scale across nodes. We’ve got so much flash and dram stuffed into the same box that the cost increase of the CPUs was pretty reasonable. We use mostly the Gold 6130 to 6152’s. You’re right that they’re more expensive. I don’t see a need for Platinum other than the higher core counts. The lower end of Platinum is more reasonable than the higher-end. I think that “Gold” is the marketing headache, not Platinum. The 51xx versus 61xx numbering scheme is a mess. They should have named the 41xx series “Bronze” and the 51xx series “Silver”. Also, while I find artificial product differentiation annoying as a customer, I respect capitalism and therefore if companies like Intel want to create premium product tiers and charge accordingly, that’s their right. That’s why the “M” variant of Xeon exists. That’s why the Xeon variants of the desktop CPUs add ECC, etc. Intel knows that people that need these features are willing to pay for them. The comment on Gold 5100 is spot on point. Xeon Jade is good. Xeon Pyrite is perfect and made mepass this article in our department. Xeon Pyrite. It’s 2018. Do I still +1 or Dilly Dilly that? 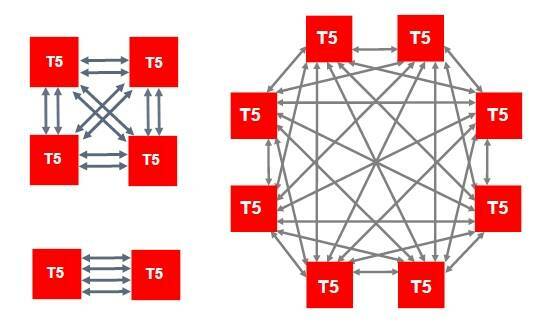 x86 always had bad scalability and that is why there are no 32- or 64-socket cpu scale up business x86 servers. The SGI UV3000 with 256 sockets is only used for clustered workloads such as HPC calculations and is in practice, a cluster and no one use them to run SAP, databases, or other business workloads – it is only number crunching. All large business servers with 32- or 64-sockets are Unix or Mainframes, there are no large x86 business servers. Just look at the SAP benchmark top spots – all belong to SPARC. x86 comes far below because it scales bad. 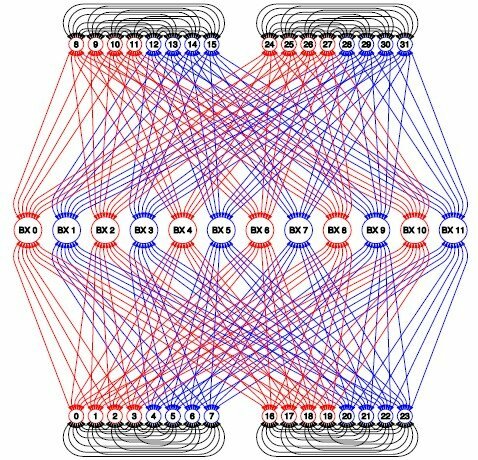 Just look at this 8-socket topology picture. Say you want to go from the top left cpu to the bottom right cpu, then you need to through another cpu. i.e. one hop. There are no direct connections between these two cpus. So performance will be penalized going from cpu to another cpu.